UPDATE: We now have a Petition to Save Peruvian Maca - Please View and Sign It Here. Thanks! Update 2016: The supply of Peruvian Maca for 2015-2016 seems to have stabilized for the moment and prices are starting to come back down. We've already been able to lower our prices to customers once and expect to be able to do so again by summer 2016. That said, there is now quite a bit of subpar Chineses grown Maca on the world market. It doesn't work nearly as well as Peruvian Maca and may actually be dangerous. Here is why to always insist on Peruvian grown Maca. Since our only focus is Organic Peruvian Maca we had to find out what is happening. What’s Causing Maca Prices to Go So High This Year? This issue, considered by many as an act of Bio-terrorism, is making international news headlines. To date these are the main articles addressing the situation. (Note that the prices quoted in these articles are already outdated). Notice that major news outlets including the Wall Street Journal and the New York Times are now also reporting on this situation. In addition AmericaTV released an informative video detailing the situation on 17 August 2014. Here’s the link to the Spanish only verision. And here is the video with English subtitles. It's very well done and worth watching for sure. So Why Do The Chinese Want So Much Peruvian Maca? The short term outlook: Fortunately, we are still able to source our Maca from the same great co-op we always use. It’s just at a MUCH higher price. That means our customers saw our first price increase in over 4 years as of September 1st 2014. We simply could not avoid that. However, since we always buy our Maca in small lots to maximize freshness we continually monitor pricing. Hopefully, as this situation plays out, our costs will come down and we will be able to lower prices again. The longer term outlook: Most experts we’ve spoken with predict that Maca pricing will stabilize within a few months. We certainly hope that it does. We also hope that the Peruvian government is successful in preventing the export of whole roots from their country as it is indeed a national heritage crop of Peru. Update as of September 2014: Little has been done to stop the mass export of Maca from Peru, unfortunately. Our suppliers indicate that the current harvest will be totally gone by year's end. The next harvest will not begin until May/June 2015. We are currently purchasing as much as we possibly can and hope to be able to continue to serve our customers with high quality Maca throughout the year. Thank you for reading and sharing this message with anyone who cares about high quality heritage foods. It’s because of people like you that we are in business. We appreciate it very much. We will keep this page updated with new developments. 22 August – We have heard from a Peruvian supplier of Maca that the government of Peru was able to stop and seize 150 tons of illegally purchased whole Maca roots on the border with Ecuador. This hasn’t been confirmed, but if it’s true, it’s certainly a step in the right direction. 23 August – According the the report linked here the Chinese government is agreeing to monitor their borders for the arrival of contraband Maca roots. Let's hope this is true. 8 September - One of our Maca suppliers has told us that the Peruvian tax authorities were in the fields trying to track down some of thie illegal transactions. This however has not had much of an effect overall. 13 September - We've heard from one of the producers that we work with that little has been done to improve the situation and that by year's end all of the current Maca harvest in Peru will be gone. 30 September - We are now being contacted by people from China trying to sell us their Maca. 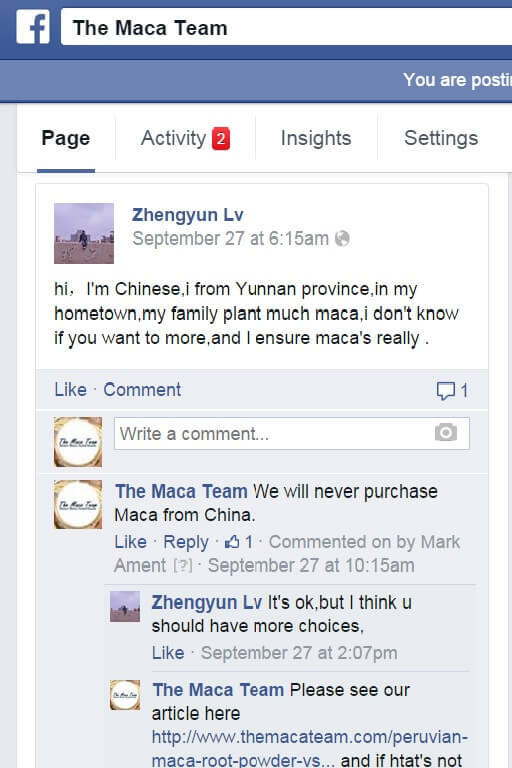 We will never buy or sell Chinese grown Maca. Find out why. 2 October - We have been told by multiple suppliers that the 2014 harvest of Maca in Peru is all but gone. The roots are all out of the ground by now and very little of them remain in the country for sale. This happened so quickly!! 10 November - We are now scraping to bottom of the barrel in terms of the 2014 harvest of Maca. What little that is left is coming at extremely high prices. We've been quoted as high as $80, but nothing less than $65 for Organic Maca this month. We are filling our warehouse as best we can in order to avoid any gaps in supply for our customers. That said we are also going to have to raise our prices again very soon. 10 December - fortunately we have secured enough high quality Maca to serve most of our customers through next May/June. That said the prices are still going up. Nearly $100 per KG in some cases. The Wall Street Journal just put out an article, so the attention to the siutation is getting even stronger. 12 December - We have launched our "Save Peruvian Maca Petition." It's in Spanish and English and we will submit it to Peru's Minister of Agriculture. Sign the Pettion Here. 1 April - In speaking with our suppliers of Maca in Peru, the situation has not changed all that much. Chinese companies are still in Peru gathering as much Maca as they can. Farmers have planted about 3 times the amount of land in Maca for the 2015 harvest so we are hopeful that by August we will have access to some of that harvest. Still the situation remains quite volatile.